THIS ARTICLE CONTAINS THE STATS, STRATEGY, AND GUIDE FOR CASTER - ZHUGE LIANG. WE WILL UPDATE THIS AS SOON AS THE GAME COMES OUT. Zhuge Liang is a 5 star Caster Class servant who prioritizes on supporting his allies in Fate Grand Order. Also known as Caster (Fate/Grand Order – Zhuge Liang), he actually is a demi-servant – half-human, half-servant. His image actually belongs that to Fate/ Zero’s Waver Velvet, a student from Clocktower who succeded Kayneth Archibald and became Lord El-Melloi II. Zhuge Liang is one of the few five star servants that focus purely on support. However, he is capable of dealing damage as well. But Zhuge Liang’s true asset lies in his ability to immediately fill an NP Gauge up to 50% in a single turn. While he cannot fight by himself, he does have some considerable abilities that allow him to sustain himself. One of those abilities include Tactician’s Advice which grants Damage Cut and an additional 10%. His noble phantasm, Unreturning Formation, is a debuff based stat which can stun and curse. It also drains NP gauges while debuffing the defense. The best way to make use of this is to have him follow up with another servant. Servants such as Altria Pendragon, EMIYA, and Heracles would appreciate his support. Most especially, Heracles, who does not have much Arts cards to use to fuel his NP Gauge. Zhuge Liang’s Attack buff can also work well with Altria especially with her using Charisma and Mana Burst. Focus on boosting Zhuge Liang’s skill, Discerning Eye. It can quickly fuel up a servant’s NP Gauge up to 30% while granting considerable critical strength which also affects Noble Phantasms. Relic of the King, Zhuge Liang’s Max Bond Craft Essence, is a good supporting CE that increases Buster performance of the entire party by 15%. This makes Buster-type Noble Phantasms hit even harder, such as the NPs of both Altria, Altera, Heracles, and several others. To boost NP even faster, Zhuge Liang can equip Heavenly Banquet or other similar Craft Essences, which boosts NP Generation by 25-30%. Some players can also opt to use Formalcraft for Zhuge Liang instead which focuses purely on the Arts cards. If using a Quick-heavy party, instead, Zhuge Liang can equip some Critical Star Generation cards such as Be Elegant in order to help them some more. Overall, the Craft Essence that Zhuge Liang can equip is flexible, and you can change it to suit your party’s needs. Always consider the other Servants in your party when choosing a Craft Essence. Zhuge Liang is a famous chancellor and regent of the state of Shu Han during the Three Kingdoms period. Unlike most prominent figures in Chinese history, Zhuge Liang’s strategy is what made him well-renown throughout the kingdoms. His military strategies is what allowed the small state of Shu to resist incoming larger forces. At some point, Zhuge Liang was often compared to Sun Tzu, the famous author for the Art of War. Also known as Kongming, he soon married a woman named Huang Yueying. However, he did not marry her for her beauty. Instead, he married her for her talent. His wife, Huang Yueying, was described as someone who had a yellow face and dark complexion but, with a talent matching Zhuge Liang’s. He also then became the advisor to Liu Bei, becoming increasingly close to the ruler. As he spent more time with Liu Bei, Zhuge Liang became both a diplomat and the logistics officer. 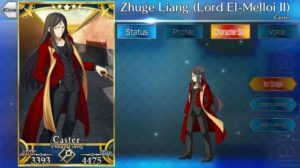 Zhuge Liang however does not take his Chinese appearance when summoned in Fate Grand Order. He instead sends Lord El-Melloi II as his replacement. However, Lord El-Melloi II (also known as Waver Velvet) soon mentioned how speaking to Zhuge Liang was like. He mentioned it was like talking to a monster, someone who had no emotion whatsoever.